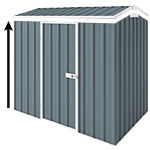 Our best selling Absco Skillion Roof Double Carports are constructed of heavy duty galvanised steel and based on solid steel construction. Nearly all of the components are pre-punched. This model is engineered to C1 Wind Rating and can be upgraded to W50. The standard height is 2.25m that can also be increased to 2.85m. These carports are manufactured to orders and the manufacturing can take up to 1 week. Loved the product, but if you buy make sure you have a good set of drills as there are not many pre-drilled assembly points in the pack, and the uprights in particular will require a decent drill bit to punch out all the assembly holes. The downpipe hole in the gutter could also have been pre-punched, as the suggested process (drilling multiple small holes and joining them up) does not really make for a great looking finish. Hi, could you please let us know what carport model you are after? For Spanbilt carports and Absco colorbond carports; the roofs, trims and down pipes are in colour. The poles and other structural steel parts of the kit are always unpainted galvanised steel.